William Basse was a poet and a member of the servant class who first comes to the attention of historians and students of language in 1602, when Basse published his first literary work, a poem of 75 six-line stanzas entitled Sword and Buckler or The Serving-Mans Defence. Once more we have that Oxfordian anathema, an artist of note with no educational records nor any aristocratic connection. Knowing that Basse constitutes one of the most dangerous holes in their argument, Oxfordians have worked like Trojans to connect Basse to Oxford and have finally, after years of desperate search, turned something up. More later. Like many 16C poets Basse sought and found patronage and published some interesting work. 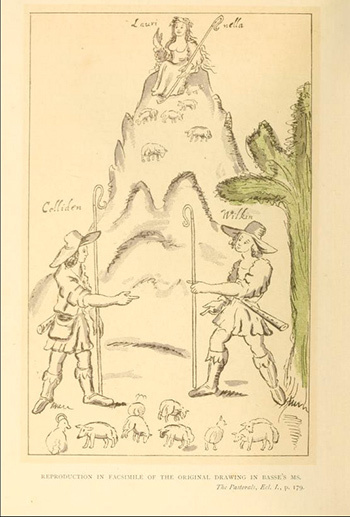 According to the Oxford Dictionary of National Biography, Basse's second published work, Three Pastoral Elegies of Anander, Anetor, and Muridella (1602), is a pleasant example of Spenserian pastoral love poetry, with a digression in the third elegy to pay tribute to Spenser as ‘Collin’. What he is most famous for--though not on the Oxfordian side of the authorship argument--is a poem written before the publication of the First Folio which, like Digges' eulogies, is highly embarrassing if you are going to argue that Shakespeare is not the author of his work. For whom your curtains may be drawn again. Honor hereafter to be laid by thee. It went viral. It was circulated hand to hand; copied and recopied out in private manuscript anthologies. The example above is from a compilation of eulogies of famous people which is in the Folger Library Digital Collection. No one knows how many manuscript copies were in circulation; but even now, 400 years later, 35 manuscript and six printed versions from the 17th century are known to survive. Of these, eight copies give his date of death as April 1616; 13 call him "Mr."; one says "On Willm Shakespear bury'd att Stratford vpon Avon, his Town of Nativity", and one specifically identifies him as the poet who has a monument in the Stratford church (Sir William Dugdale's notes for his 1656 Antiquities of Warwickshire, written before 1649). Those who most admired the poet knew exactly who he was. Being snarked at by Ben Jonson is an immortality to die for. So is being taken for John Donne: Basse’s poem was first printed in 1633 as Donne’s; then reprinted at last in the Fourth Folio (1640) under Basse’s name. Basse's poem can be securely dated. It must have been written after Beaumont’s death in February 1616, and before Ben Jonson quoted it (almost verbatim) in 1623, in answer to what must have been a widespread sentiment. Those dates don’t fit his lordship well at all. His death in 1604 had passed unnoticed. Oxfordians who see this poem as a call for exhumation of the earl come up against the threefold, fourfold recognition of the poet William Shakespeare: he was a gentleman; he died in April 1616; and is buried in Stratford-upon-Avon; where he was born. Not much wiggle room in that. This Avon isn’t Hampton Court. Here we see the same apples vs oranges argument that we confront with 99 percent of everything the Stratfordians put forth, in which they simply ignore the central factor in our thesis, the hiding of the authorship! ,To them, everything published that refers to the authorship is straightforward and to be taken at face value. 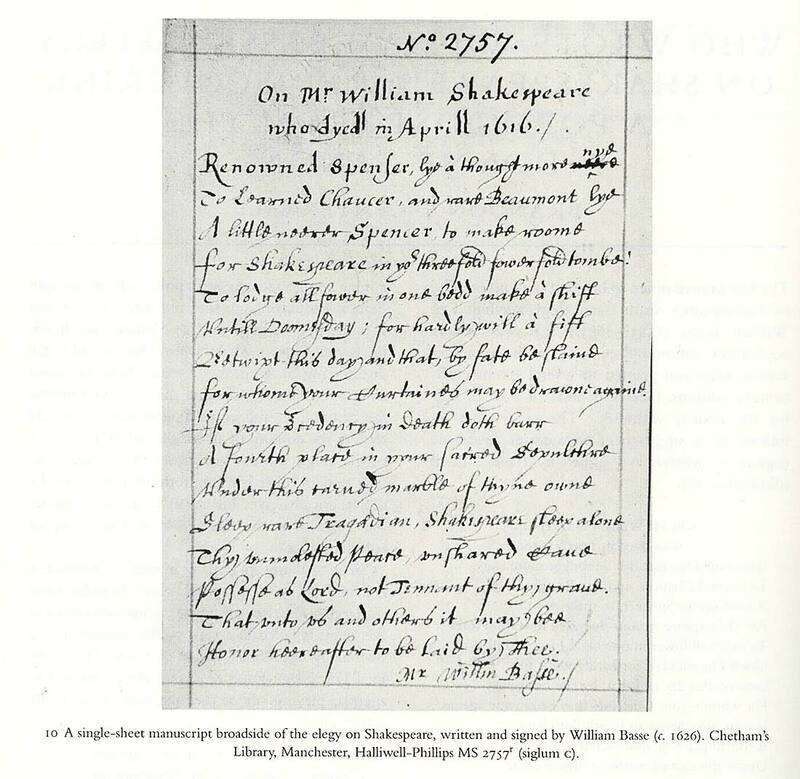 Since it’s clear (to us) that William of Stratford could not possibly have written the plays, or anything for that matter, there being no direct evidence of his ability to write but the six shaky signatures on legal documents, the attribution to someone else must have been due to the need to hide the identity of the true author. Therefore, to us, everything published by the Establishment that refers to the authorship is necessarily suspect. Note how the actual evidence is made irrelevant by the idea of the all-consuming establishment conspiracy. 'The hiding of the authorship' is used like a magic wand that makes every inconvenient fact disappear in a puff of casuistical fantasy. You will find exactly the same statement about Establishment cover-ups in every conspiracy theory, from birthers and truthers to the people who believe that an alien purple aura is waiting to consume the entire planet. The extent of the Oxfordian madness was recently revealed in a discussion thread on the website of American Libraries Magazine. It is often apparent in discussion columns that the Oxfordian left hand is completely unaware of what the Oxfordian right hand is doing. In an attempt to make the poem look 'too posthumous' to be of any use, the left-hand Oxfordian bobleblah argued that there was no evidence that Basse's poem preceded the publication of the First Folio. Meanwhile, Oxfordianism's right hand, Roger Stritmatter inadvertently admitted that Basse's poem definitely referred to Shakespeare. Without a doubt. Normally, open discussion of the Basse poem is waved away, dodged or ignored by Oxfordians as it comes dangerously close to being the silver bullet that blows their whole case inside out. It contradicts a raft of claims they deploy in support of the idea that there are no contemporary references to Will as a writer, then overturns the claim that there are no eulogies to mourn his passing and worst of all, it directly connects the name of the playwright, to his reputation and his burial in Stratford-upon-Avon. In short, it sinks the whole Oxfordian ship. It is remarkable that you would admit that the Basse poem urges "Shakespeare" to be buried in Westminster Cathedral, especially in light of the fact that Alexander Waugh has recently very convincingly argued that, according to the Stratford monument, that is exactly where he is buried. Westminster Cathedral as any Londoner will tell you, is two stops on the 73 bus route beyond Westminster Abbey where the tourist can find Poet's Corner. Misplaced exactitude. Not an uncommon Oxfordian failing. Westminster Cathedral wasn't there at all when Basse wrote his poem and if Waugh has proved that Oxford is buried in the cathedral then there can be no further doubt as to his Catholicism. So here it is. Stritmatter's big factual stick which he believes will disqualify Basse's poem as evidence that Shakespeare was a playwright from Stratford upon Avon. It's the old Oxfordian Law of Proximity again. Poets just need to pass any Oxfordian doorstep, even years after he died, and they are enslaved to his conspiracy. As also mentioned, the daughter, Bridget, who ended up not marrying Pembroke, married instead Norris, who employed William Basse during the years in which this poem was almost certainly written. Basse worked for Norris? Where on earth did he get that? She needs Basse to be working for the “Family,” in order to pull off his assignment in the "Shake-speare" scam. That false idea arose from a conjecture in N&Q (1850) and copied in the DNB that "[Basse] seems also to have been attached to the noble family of Norreys." Why? Because he "addressed some verses to Francis Lord Norreys, Earl of Berkshire." So he did, in his manuscript collection, Polyhymnia. A "Norreys" autographed the flyleaf of one MS: this must, therefore, be Francis Norris. The verses are inscribed to the Earl of Berkshire: they must, therefore have been written between 1621 when that title was created and 1623 (!) when he committed suicide by crossbow. And Basse must have been working for him, because no one ever dedicates a poem to a nobleman unless they're part of a conspiracy. There are several problems with this scenario, the first being the unlikelihood of Berkshire's entering a conspiracy to celebrate yet mask his estranged wife's long-dead father. The couple had separated by 1606, and by 1621 he’d lived apart from her for twice as long as they’d been together. Norris was a quarrelsome man, and if he had been told such a secret, he would probably have blabbed it, to spite his ex. Secondly, there's no evidence that the "Norreys" on the flyleaf is his signature. Thirdly, that poem is inscribed “To ... Francis Lord Norreys Earle of Berkshiere (in his dayes).” That means that someone else is Earl of Berkshire now: Francis Norris is dead. (The astute among you will note: no ordinal.) So the very earliest this manuscript could have been written is 1623. Which is rather too late for Oxfordian purposes. And it's actually much later than that. The collection itself is addressed "‘To the Right Noble and vertuous Lady, the Lady Bridget Countesse of Lindsey, Barronesse of Ersbie, & of Ricot, &c." This was Bridget de Vere and Francis Norris's granddaughter, Bridget Bertie (1627-1657), who married the widowed Earl of Lindsey sometime after 1646. But Miller cannot allow that: or her house of cards would tumble down. Like all of her cult, she must contort the facts to fit her precious theory. Since she absolutely has to push this manuscript back before 1623, she cannot even see “Countess of Lindsey”—a title created in 1626—on the page before her. As long as she was careful not to look at The Poetical Works of William Basse, edited by R. Warwick Bond (London: Ellis and Elvey, 1893), she could go on believing in her Schrödinger’s Bridget, both Berkshire and Lindsey, both dead and alive. There exists a manuscript collection of Browne’s poems, in his own hand (British Library, Lansdowne MS 777). There is much that both sides agree on about this poem. There is no doubt, for example, that it refers…to "William Shakespeare,"
After dancing around the edge of the abyss, Wily Coyote suddenly looks down, finds no ground beneath him, pulling that face that tells you he's just remembered why Oxfordians normally avoid Basse like a plague of Baconians. For having agreed on that, it follows that if 16 copies of the poem in manuscript variously refer to his death in April 1616, call him "Mr", or refer to Stratford upon Avon as the town of his nativity, then we can only be talking about an armigerous actor/playwright, born in Stratford-upon-Avon, who died in April 1616. Well. There's only one candidate in that case. Needless to say, the Oxfordian reticence on Basse instantly reappeared since when nothing more has been heard from any of them on the subject. and sincke a cas before one's eyes. To bury that Oxfordian mobbe. In all of the copies that give his date of death as April 1616 or his birthplace as Stratford-upon-Avon, the spelling is "Shakespear[e]" or "Shakespeare". 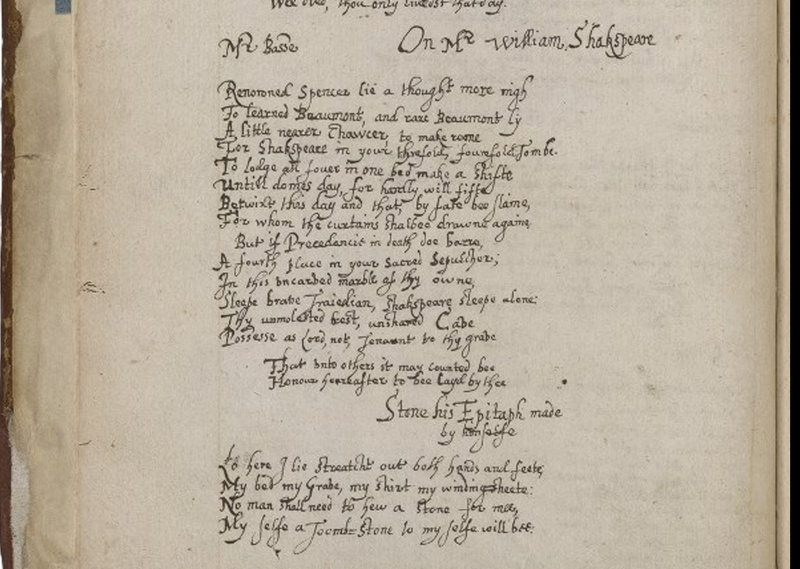 Six copies spell his name as "Shakspeare" (including one headed “An Epitaph prepared for Shakspeare, if hee had been buryed at Westminster"); two, as "Shackspeare"; and one--oh joy!--as "Shak-speare." That should puzzle the hyphenation-theorists. The Stratford man's name is spelled "Shakespear[e]." The poet's name is spelled "Sha[c]kspeare." And they are one and the same. There are 33 copies of the Basse elegy listed in Wells and Taylor, 27 manuscript and six printed. Centerwall lists an additional seven manuscripts and one printed, and Reedy adds one manuscript. Of those listed by Wells and Taylor, 58% use some variant of the "poet's name," with "Shake" as the first syllable; 36% are spelled "Shak" or "Shack," like the so-called "front man's" name. One of those has a hyphen, but uses "Shak": which rather spoils the Oxfordians' beloved euonym. One just says "An Epitaph," and one is untitled. Just a shade under half the copies--16--identify the poet as Mr Shak[e]spear[e], and/or say that he "dyed in April 1616," or name Stratford as his birthplace and where he is buried: all make it absolutely, unequivocally unambiguous that the poet is the man from Stratford. "Mr" is linked with "Shake" about as often as it is with "Sha[c]k," proportionate to their overall usages. What's striking is that =all= of the appearances of "April 1616" and the one mention of Stratford are linked with "Shake." The Oxfordian euonym--vultus/Tela vibrat!--belongs to the grain-hoarding illiterate peasant.